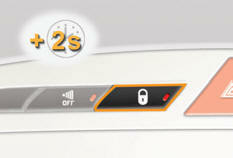 Pull the interior control lever of a front door; this unlocks the vehicle completely. 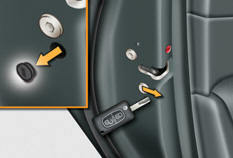 System which provides full automatic locking or unlocking of the doors and boot while driving. System allowing the doors to be locked and unlocked manually in the event of a malfunction of the central locking system or battery failure. Insert the key in the door lock, then turn it to the rear. 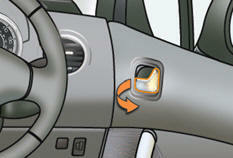 You can also apply the procedure described for the passenger doors. Insert the key in the door lock, then turn it to the front. On the rear doors, check that the child lock is not on (see Child Safety). 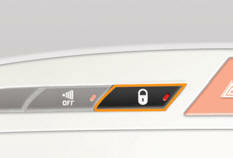 Remove the black cap, located on the edge of the door, using the key. Insert the key in the socket without forcing it, then without turning it, move the latch sideways towards the inside of the door. 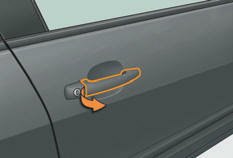 Close the doors and check that the vehicle has locked correctly from the outside.